George Collett, Dr Will Young, Professor Ken Gilhooly and Professor Mary Gilhooly. The aim of this PhD project is to examine factors associated with cognitive functioning. This is an important aspect of healthy ageing and quality of life. There is no current research on the cognitive/mental health effects upon British nuclear test-veterans from witnessing nuclear tests, and more research is urgently required. However, this aspect is being explored with increasing priority for people elsewhere, affected by radiation effects from the Chernobyl and Fukushima incidents. A special feature of this veteran study is an examination of radiation ‘exposure worry’ and cognitive functioning in later life. Specifically, we will be examining whether levels of ‘exposure worry’ predict cognitive functioning. Furthermore, we will examine whether employment history and education are related to levels of ‘exposure worry’ and cognitive functioning. Later in 2019, we will be exploring the mechanisms of ‘exposure worry’ and how it may develop after witnessing a nuclear test. The overall project will invite members of the British nuclear test-veteran community to participate and will involve data gathering via in-depth interviews, questionnaires, and cognitive assessments. In May 2018, we conducted a focus group discussion with six test-veterans and two test-veteran wives at the British Nuclear Test Veterans Association Annual General Meeting in May. The discussion was fascinating regarding the test-veterans’ experience during the nuclear testing programme and the impact that it had left on their lives. The discussion was also very insightful regarding the development of our proposed ‘exposure worry’ scale, in terms of the language used and the particular aspects which constitute ‘exposure worry’. Recently, we held telephone discussions with a handful of test-veterans to gain further insight into the design and content of the proposed scale. Currently, we are testing our proposed ‘exposure worry’ scales to ensure that it is valid and that it “works”. In order to ensure that our scales work, we need as many test-veterans as possible to take part. This will result in a useful tool to examine the presence and severity of worry in the nuclear test-veteran community. This may also be used to indicate whether or not extra support must be put in place for test-veterans to help overcome their worry. 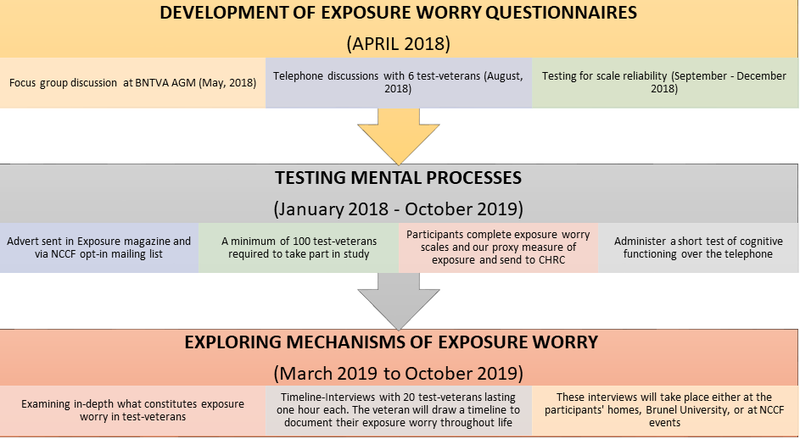 For the next stage of the project, we will be conducting cognitive assessments with the test-veterans over telephone, in relation to their levels of ‘exposure worry’. Participants will be required to complete a few very short questionnaires and return them to us, before taking part in a 10-minute telephone test of cognitive functioning. This study would add to the growing body of research on the impact of life events on cognitive functioning in old age. The benefits from this research would be wide, because a deeper understanding of the factors that influence decline in cognitive functioning with age would be of interest to older people across society. The health services would also benefit from a better knowledge of the factors contributing to poorer cognitive functioning and dementia. The present study will also apply to the psychological effects of being exposed to chemicals such as Agent Orange and the Bhopal Gas Tragedy. What do we already know about radiation exposure, worry, and cognitive functioning? Recent studies suggest a link between radiation exposure and faster biological ageing (Ilyenko, Lyaskivska, & Bazyka, 2011), and as a consequence, to age-related diseases which may impact mental processes (Bazyka et al., 2013; Yaffe et al., 2011), known as cognitive functioning. Cognitive functioning includes memory, problem solving, and reasoning. There is evidence following Chernobyl suggesting that higher levels of radiation exposure in adults is associated with reduced cognitive functioning in later life (Loganovsky & Zdorenko, 2012; Gamache, Levinson, Reeves, Bidyuk, & Brantley, 2005), although the relationship between lower levels of radiation exposure and cognitive functioning is not clear. However, public health studies examining Hiroshima survivors did not find a link between levels of radiation exposure and dementia (Yamada et al., 2003), nor a link between radiation dose and cognitive decline in later life (Yamada, Landes, Mimori, Nagano, & Sasaki, 2016). Aside from the physical effects of radiation exposure, the World Health Organisation has argued that mental health impact is one of the biggest consequences following a nuclear incident. For example, widespread anxiety and depression in both contaminated and decontaminated regions surrounding the Chernobyl area have been observed (Pastel, 2002). Even in people who were exposed to very low levels of radiation, the psychological effects can be large and persistent (Danzer & Danzer, 2016). The term radiation-anxiety is used to describe the worry regarding the possible negative health effects of radiation exposure, as well as any perceived stigma relating to radiation exposure (Fukasawa et al. 2017). Research has suggested a link between poorer cognitive functioning and greater levels of anxiety in older adults (Sinoff & Werner, 2003; Beaudreau & O’hara, 2008). Although anxiety is not the same as stress, the two are closely related and both are associated with raised blood pressure (Byrd & Brook, 2014). High blood pressure in mid-life has been associated with poorer cognitive functioning in later-life (Gottesman et al., 2014). Furthermore, anxiety is associated with health-risk behaviours such as smoking and heavy alcohol consumption, both of which contribute to poorer cognitive functioning in later life (Sabia et al., 2014; Debette et al., 2011; Rusanen, Kivipelto, Quesenberry, Zhou, & Whitmer, 2011). It is possible, therefore, that besides any impact of possible exposure to radiation on cognitive functioning in old age, persistent worry about the potential damage to oneself and to one’s children could also impact the cognitive functioning of test veterans.